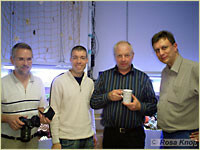 Edwin Reitz and his wife from Rainforest Film Produktion GmbH visited me. Please see an interesting video and a report about my breeding plant. Alf Jacob Nilsen, Svein Fossa and Daniel Knop visited me. After a lot of shoptalk we had a brilliant winetasting in our winery. It was really nice and very interesting evening. Thank you again for your nice visit.